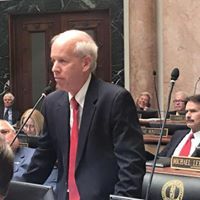 As your incumbent State Representative for the 68th House District, I am running for re-election this year because I recognize that Kentucky has an historic opportunity to permanently place the Commonwealth on a sustainable path to economic prosperity. With your support, we will seize this opportunity on November 6th. Before Republicans gained control of the State House in November 2016, Kentucky had been mired in a swamp of high unemployment and low economic growth. While controlling the Kentucky House for 95 consecutive years, House Democrats consistently adopted socialist tax and spending policies that drove new entrepreneurs and existing businesses to neighboring states with more favorable economic prospects. For years, Kentucky Democrats believed that higher taxes and more regulations on employers, such as a $15 per hour minimum wage, would somehow create more jobs. The Democrats continued to borrow and spend money on patronage projects and ignored their looming pension obligations to teachers and state employees. In response to these ill-fated Democrat policies, Kentucky manufacturers moved further to other states or countries while coal mining companies simply shut down and declared bankruptcy. In our first week serving in the majority, House Republicans passed historic legislation that has transformed the Commonwealth into an economically prosperous and fiscally responsible place to live, work and raise a family. As a result, Kentucky workers are free to decide for themselves whether or not to join or pay dues to a union. Taxpayers now pay normal market wages for state funded construction. Lawmakers’ salaries and pensions are open records. Unborn children are guaranteed the right to life after 20 weeks gestation. Kentucky women are now given the opportunity to see their baby’s ultrasound before submitting to an abortion. These conservative Republican policies have exponentially increased business investment throughout the Commonwealth, including Amazon’s massive project near CVG Airport that will create over 3,000 new jobs that pay $70,000 per year on average. Kentucky’s unemployment rate has dipped to 4%. Campbell County’s unemployment rate is currently tied for lowest in the state at 3.1%. This level of economic growth and investment is unprecedented in the history of our state and county. I have proudly advocated for these policies over the course of my 20-year career in state office. Finally, during the 2017 session, House Republicans were able to pass these important measures over loud protests from liberal democrats and their socialist allies. As a result, Kentucky is more business-friendly than ever. Business is booming, especially in Northern Kentucky. According to the non-partisan Tax Foundation, Kentucky’s competitive tax climate has improved from 33rd to 17th place in the nation. The people of the Commonwealth expected House Republicans to deliver on its promises of economic growth, family values and personal freedom. We delivered. Kentucky House Republicans cut state income tax rates from 6% to 5%, saving most families about 16% off their last years’ return. We made the process of adopting children easier and faster. We saved unborn babies from dismemberment abortions. As chair of the House Judiciary Committee, I passed Jenna’s Law that protects teen-age girls from brutal rapists. We made it easier for young children to provide testimony about predators that may have abused them. We increased jail time for those who sell deadly drugs and provided more funds and treatment for their victims. These policies have given Kentucky families renewed hope and strength. House Republicans also delivered on our promise to repair the broken state pension system without reducing promised benefits to current members, without cutting SEEK funding of public schools, and without raising taxes. After decades of neglect by House Democrats, the new Republican Majority voted to fully fund the teachers’ and public employees’ retirement plans, under the revised actuarial guidelines. House Republicans also appropriated an additional $550 million to begin paying off the $40B pension deficit that Democrats had allowed to accumulate. I personally managed to add more than $7M in the budget for reconstruction of Johnson Elementary School in Fort Thomas, despite the severe budget constraints. Today, as a result of these sensible Republican pension reforms, Kentucky teachers and public employees enjoy more security in their future retirement years than they have for decades, while the Democrats mismanaged their system. From 2010-2016, House Democrats annually appropriated about $250M (on average) to the teachers’ pension plan (KTRS). Since 2017, the new Republican General Assembly and Governor Bevin have budgeted over $750M per year to KTRS, a 200% increase. By the way, not a single House Democrat joined us in reforming the system and fully funding it. As an attorney who has worked in the financial services industry for over three decades, I understand the risks and benefits of pensions and other retirement plans. I deal with actuaries on a daily basis in my profession. What I don’t understand is how union leaders can stridently oppose a plan that fully funds and restores financial stability to a broken system so that teachers can rest assured that they will receive all the benefits they were promised. Do teachers really want Democrats to regain power just to squander their pension funds again? I recognize that most opposition is driven by partisan politics. I understand that House Democrats want their political power back. But to what end? For decades, they ignored the fiscal problems that have kept our state and future generations mired in debt. They refused to cut taxes and regulations to attract 21st century businesses to the Commonwealth. Even today, they have no realistic plan to raise the economic tide that can lift all Kentuckians to a higher level of success. House Democrats have always been more interested in pork barrel politics than fiscal responsibility or economic growth. Over the past two years, Kentucky has made great strides under House Republican leadership. We have cut income tax rates and reformed our tax code. We have fully funded and saved the pension system without changing benefits. We have increased funding for public education to record levels. We have reformed the adoption process and cut red tape. We have rescued babies from late-term abortions. We have locked up drug dealers and other criminals who prey on defenseless women and children. We have offered hope and treatment for addicts. We passed Marsy’s Law to give crime victims a voice in the criminal justice system. We can all take pride in these achievements because of the benefits they bring to every Kentucky family. This is why the voters gave Republicans the House Majority. But there is more to accomplish in the next biennium. I intend to permanently lock-in these conservative policies. I will propose further cuts in income tax rates. I will re-file the Kentucky REINS Act that will allow the General Assembly to strike down oppressive regulations. As chair of the Judiciary Committee, I will move legislation, such as my Asbestos Transparency Bill, to bring meaningful reform our civil justice system. I will make our streets and highways safer by penalizing those who take illegal drugs and then drive under the influence. I will continue to fight for public education by fully funding teachers’ pensions and the SEEK formula. I will advocate for building a new Grant’s Lick Elementary School. And I will always protect innocent human life from conception until natural death. For these reasons and many more, I am running for re-election as State Representative for the 68th House District. I humbly ask for your support on November 6th.